Vatican Easter Events 2019 Rome, Italy 19 – 21 April 2019 Pope Francis will lead the Way of the Cross (Via Crucis) at the Colosseum in Rome, on Good Friday, April 19. On Sunday April 21, Pope Francis will celebrate Easter Mass in Saint Peter’s square at the Vatican and deliver his Urbi et Orbi message and blessing to the City and to the World, from the central loggia of St. Peter's Basilica. Pope Francis will lead the Way of the Cross (Via Crucis) at the Colosseum in Rome, on Good Friday, April 19. 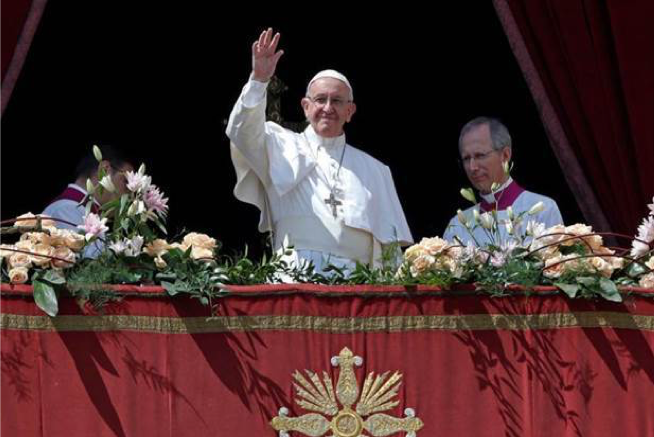 On Sunday April 21, Pope Francis will celebrate Easter Mass in Saint Peter’s square at the Vatican and deliver his Urbi et Orbi message and blessing to the City and to the World, from the central loggia of St. Peter's Basilica. Holy Mass of the Chrism, Vatican Basilica. 7:30-09:45 GMT approx. Celebration of the Passion, Vatican Basilica. 15:00-17:15 GMT approx. Way of the Cross, Colosseum. 19:15-21:00 GMT approx. Easter Vigil, Vatican Basilica. 18:30-21:00 GMT approx. Holy Mass of Easter, Urbi et Orbi Blessing, St Peter’s Square. 08:00-10:30 GMT approx.